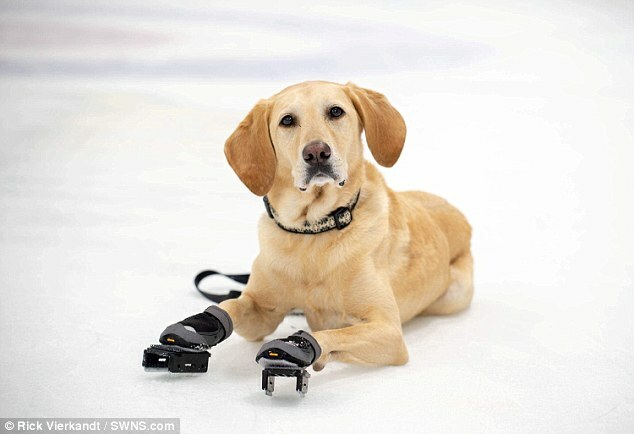 A lovable rescue labrador has become the world's first ice-skating dog. 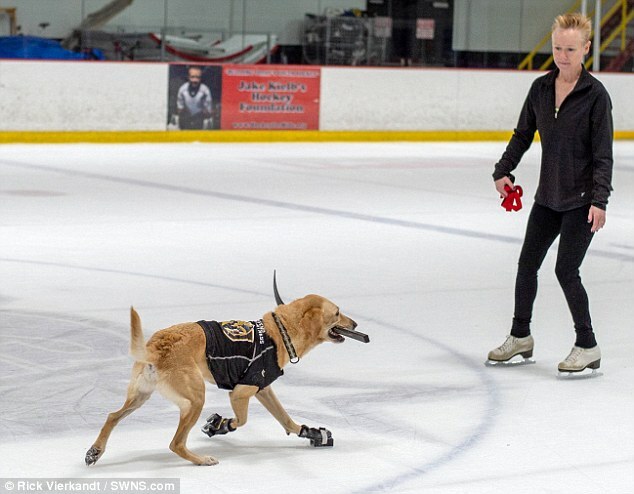 Benny the golden labrador retriever has been learning to skate with his owner Cheryl Del Sangro after she rescued him at just a few months old from euthanasia at a shelter. 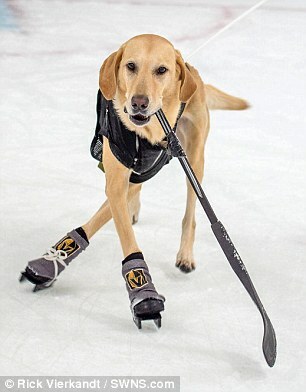 The animal lover has since taken Benny, now 5, training once every two weeks at the Las Vegas Ice Center, teaching him an array of tricks including turns, crossovers and bunny hops. 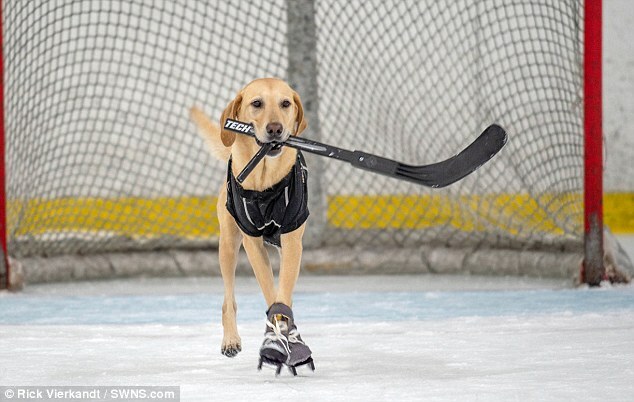 The sweet footage shows Benny scrambling around the rink in tailor-made skates with his own hockey stick and personal puck which he pucks up with his teeth. 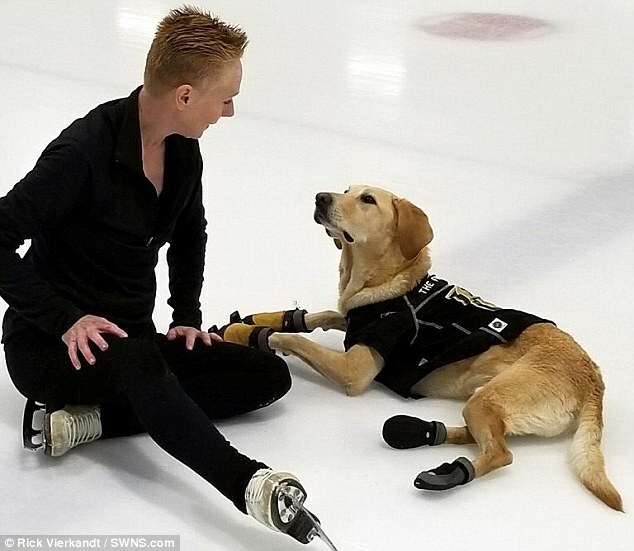 Former ice-skating coach Cheryl Del Sangro, 56, took him along to a rink last year to practise and noticed that he loved scooting around the ice gleefully picking up pucks and said she was inspired and decided she would train him. Animal lover Cheryl, who has three other dogs-all of whom she trained- had always noticed that Benny was 'uncommonly smart and agile'. He can now perform over fifty trick including effortlessly skating with a stick and puck. Del Sangro, originally from Cleveland, has taught skating for 20 years before moving to Las Vegas with her husband to operate a restaurant. She adopted Benny the day before the decision was made to put him to sleep at a shelter in Salt Lake City. It is not clear why the animal was to be euthanized as the puppy was healthy but in due to various factors such as overcrowding in shelters, it is not uncommon for animals to be put to sleep. Benny loved his time at the center. He scrambled around the ice, picking up pucks, then a stick. Del Sangro made a pair of skates with the help of a local shoemaker, and a dog-boot company out of Canada. 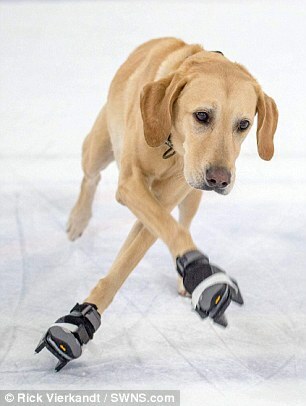 Benny wears the skates only on his front paws; the back paws provide traction. 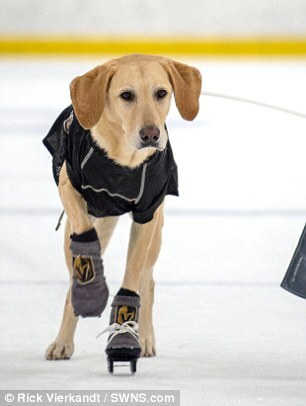 The next step is for Benny 'the Skating dog' to perform as part of the Las Vegas Golden Knights' professional ice hockey team's on-ice entertainment lineup.